At dinner the other night, we were talking about an article I’d seen on Jezebel (and immediately sent to Luau after reading no more than the headline: Why Are Women Obsessed With Investigation Discovery’s Grisly TV Shows? 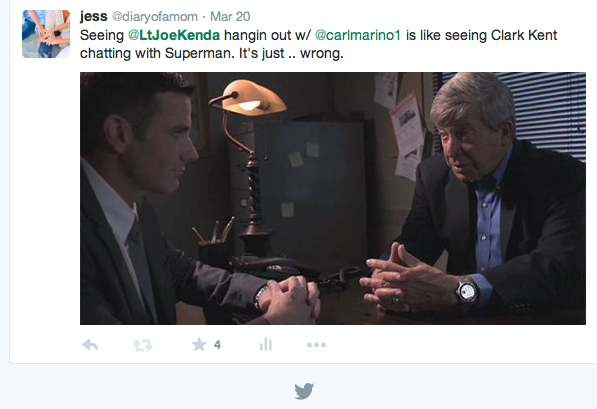 As a woman who is indeed obsessed with ID’s grisly TV shows (Hullo, Joe Kenda?) for reasons that I’ve never been fully capable of conveying to Luau (who thinks it’s creepy and sometimes worries for his own safety), I was flabbergasted to find out that this was an actual thing. Like, there are other people out there in the world who would, if left to their own devices, binge watch true crime dramatizations for hours on end despite (I assume) being emphatically non violent people like me. Anyway, none of this is really the point. And I do have one, I swear. I was telling Luau that I’d been amazed to find out that there’s an actual community of ID enthusiasts who come together around their ID fandom. Apparently they live-Tweet certain shows, working through the mysteries together and trying to solve the whodunnits before finding out, well, who done it. Overlapping her words, her sister piped up. “You like scripts, don’t you, kiddo?” I asked. “That’s your jam,” said her sister. I basked in the moment, In the knowledge that my kid has a jam. And even more, in watching her discover that it has a very real, important, and even, as a bonus, commercially viable function not just for her, but for other people too. And then I sat quietly for a while. And I chewed on this. (Go ahead and read that. I’ll still be here in the middle of this thought when you get back, I promise.) And I marinated in the fact that it’s really been such a short time (and forever) since I sat there across the table from John scratching my head and wondering how on earth he had the audacity to say that there were gifts in autism when all I saw — all I could possibly see through my frustrated, scared, angry, sad Mama filter — were its challenges. And now this, one of the most prominent of those challenges and greatest of my fears, was — is — one of my girl’s most potent gifts. Once lamented as no more than a lack of novel language and a painfully restrictive lexicon, later used as a springboard for linguistic development and interaction, and now? Now celebrated as a gateway to memory, mimicry, creativity, the WRITING OF PLAYS, the casting of roles, and Heaven knows what else? Scripts are my girl’s jam. Love, love, love, a hundred times love!! Perhaps a future playwright, or poet, or actress, or……well, anything she wants to be. Because she is ABLE to be. “How about that?”, you ask. I love that Brooke has a jam. That’s how about that. To a great extent, life is a script. Isn’t it? Love this as always, but I am a little confused. “…as I sat there across the table from John…”? I left out the most important part! Brooke has a jam! Rap Star, Singer, Actor, Writer? The sky is the limit, beautiful one, and you keep reaching for those stars. Brooke understands life more than some adults I know! Oh dear God. I’m so sorry.